As a business owner, we all end up playing the role of sales person, Salesforce.com specialist, general manager, supervisor and almost every other hat in the bag. Whether you are working as a sales representative or customer support person for the moment, having a grateful mentality towards your customers can be very beneficial. Using thank you business sayings is a great way to get started. First off, an appreciation from businesses tells your customers that you care. You are not some cold-hearted person in it to take their money and run. Your thank you sayings articulate that you genuinely appreciate their business and want to provide a useful service or product. Secondly, when people know you are a genuine company, they are more likely to award you repeat sales because they trust you. For those of you selling lower priced products and services, you will probably agree that repeat business is the key to success. Another way to insure repeat sales is through great customer service. Furthermore, customers are more likely to refer companies or small businesses which they trust (and have a relationship with). But, being genuine in your thanks is not as easy as it sounds. Many companies generically write “Thank you for your business!” at the bottom of an invoice. Is that genuine? Perhaps, it is meant well. But to your customers, it can be hard to tell. Of course, you can mix and match. The key points to take away in your business communications are customization, specificity and enthusiasm. These three factors help your message become more personalized and genuine. The best thank you sayings for business focus less on the phrase itself and more on the words following it. If you truly want your business thank yous to stand apart, make use of great writing. Instead of saying “Thank you for your purchase,” why not try “Thank you for purchasing such an important item from our store. Your faith in our services and products is greatly appreciated, and we look forward to your continued business.” Which one sounds better to you? When you take the time to elaborate on your business thank you notes, your customers will notice. This strategy can work for e-commerce stores or a business lawyer too. A little bit of extra time spent writing a great thank you will reflect in your customer retention rate and yearly sales. 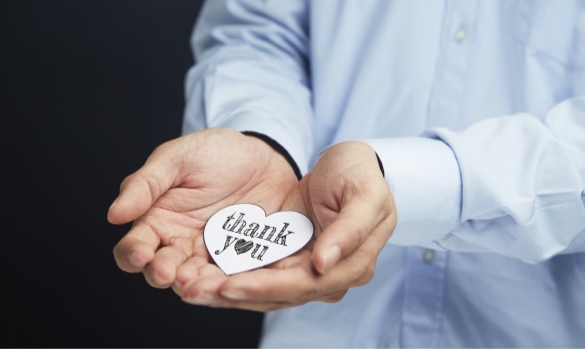 Your thank you saying can express how much you appreciate their business while asking for repeat business. A simple note like the following could work, “Thank you for giving us the chance to serve you. We hope that you will call us again whenever you need our services.” This statement lets your customers know that you are very grateful and still looking forward to working with them again soon. You can even include this type of thank you message on your packaging. Just take to your box manufacturers about creating the right design and placement. Want to take it up a notch? Try actually writing your message by hand. Customers will truly appreciate a note, memo or letter that is written by a person. If you dine out a lot, many servers will employ this strategy by adding a small written smiley face and thank you to the bill. When thinking about a tip, it is pretty hard not to notice the additional touch to connect. Great written article I am a small business owner in Australia also and treating customers with respect also makes a difference . Adding that little extra without getting paid or asked, do the job you said you would without a follow up. Good customer service will come back 5 fold in word of mouth referrals and repeat business.